The definition of a “code” is, a system of words, letters, figures, or other symbols used to represent others, esp. for the purposes of secrecy. That “Jordan Code” is now APPEARING to be easier to decipher. The decision on whether to keep the name, Charlotte Bobcats has till now remained a mystery. The Bobcats have been very quiet, and understandably so, since another franchise is currently using that name. I expect that that silence will continue until 4/17, when the Hornets name is officially up for grabs. Recently, we have seen the purging of Charlotte Bobcats colored Jordans at the Heat game, an announcement of a “Town Hall” meeting on 4/15 with the future NBA commissioner Adam Silver, and the signaled dropping of an entire teal and purple Jordan line also on 4/17, coinciding with the end of the Charlotte Bobcats season. Today, a friend of mine received an invitation from the Charlotte Bobcats to attend a presentation about “the Bobcats future” to be made prior to the last game, next Wednesday (he received 2 tickets and I will be attending). Thursday, 4/18, the day after the season is over, the Charlotte Bobcats will host and Open House…the final clues seem to be falling into place. As in the past, we caution you that this may be one giant, big, huge, coincidence, OR we are on the brink of becoming the Charlotte Hornets!!! Either way, this Saturday’s final SILENT SWARM has now become VERY important. ← This Saturday Charlotte Hornets fans unite for one last SWARM! Hornets or no Hornets, both of you did something that couldn’t be done in Charlotte for quite some time. That’s creating buzz about our basketball team. I think there is some good news coming though. I second Sam’s comments. What you all have done is exciting and inspirational. 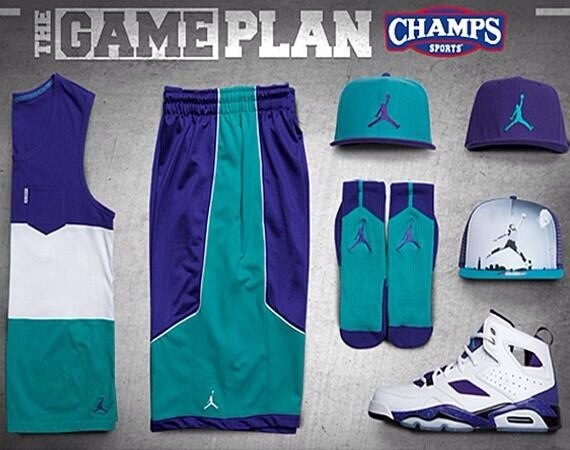 I look forward to the first Charlotte Hornets game since 2002. I hope when/if this change happens you keep the movement going, you are exactly what this city needs in activists achieving their goals through the grassroots. Not a Hornets fan, but I stumbled upon this article, and just wanted to also add that there are a retro release of Jordan’s Grape V’s coming out the first weekend of May. The Grape V’s are known for these colors as well, I’m thinking it’s just to match the shoes coming out, which they usually do. They’ve done it in the past but not a line of this magnitude and timing.